Experience the importance of learning to produce quality products through demonstrations on proper machinery maintenance and operation. At GED our top priority is our customers’ success—when you succeed, so do we. 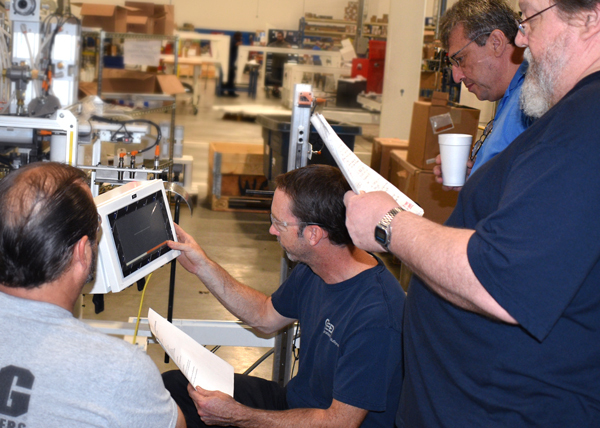 In order to ensure our customers are efficiently producing high-quality products, we offer a variety of training courses to certify your employees in proper maintenance and operation of state-of-the-art GED equipment and technology. Our mission is to equip your staff with crucial industry knowledge—as well as machine-specific and technical knowledge—essential to maintain and operate GED products such as the Intercept® Spacer Fabrication Systems and Stainless Steel Glass Washers. GED’s training staff will use both theory and “hands-on” instruction styles to approach the course work. Get your glass and/or window production facility operating at optimum quality, safety and efficiency by enrolling your manufacturing and operations team in GED Training courses. Each class includes written reference materials for students to keep, and students who successfully complete the course receive a certificate. Learn more about what is expected of trainees by reading the FAQs. GED offers both in-house (at the new GED Customer Experience [CX] Center) and on-site (at your manufacturing facility) training, by appointment. Send a team from your company to get a hands-on learning experience in GED’s new Customer Experience (CX) Center. Equipped with GED’s vinyl and IG production lines and 2 training rooms (one for software training and the other for equipment training), our 24,000 square foot CX Center grants trainees access to machines and tools needed to complete a series of courses. Courses include classroom time and “hands-on” lab time working on actual machines, plus time in our Software Lab using GED Software. GED will come to your site and train employees on your GED equipment. If you don’t see a course listed that you need or a date that fits your schedule, contact us for more information, as many times we are able to create a customized training course specific to your needs.